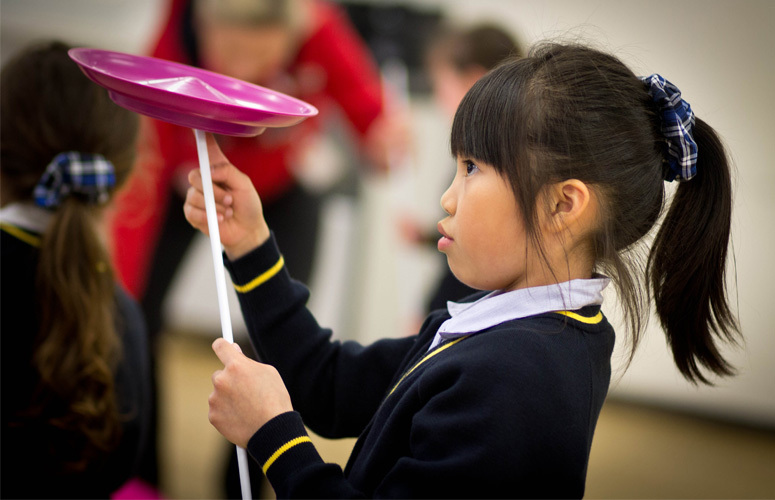 ‘I wonder if I could juggle or make people laugh with clown tricks?’ The girls had a chance to find out at the PTA-funded circus skills workshop on Thursday 12th April. We were delighted to welcome Tom Kellett from TK Arts to the school – he has been running circus events for children for over 20 years and shared his enthusiasm and skills with us all. 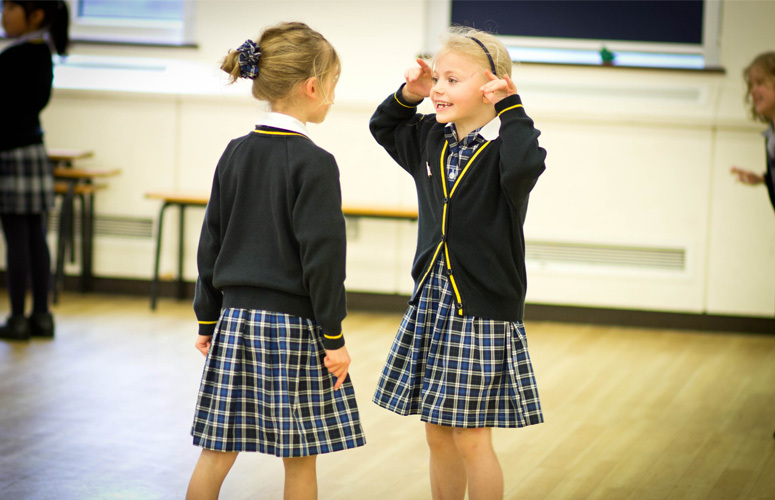 The Junior School swapped lessons for circus activities on their first day of the new term and the senior school were entertained and had the chance to have a go during their lunch break. First up was developing balance skills with a huge peacock feather. All the children showed their balancing skills, managing to walk and jump with the feather on their hand, finger and even chin! Next it was spinning plates on a stick and doing multiple plate spins with Tom. This is harder than it looks but lots of children (but not many teachers) could do it. 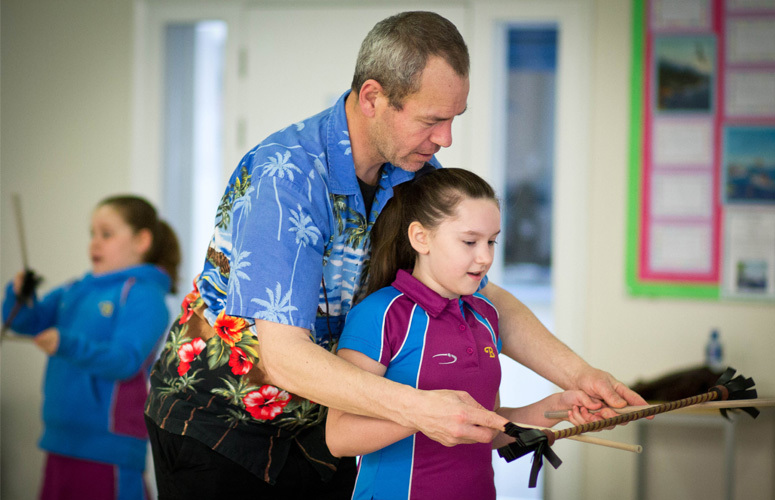 Holding the stick vertically and moving it correctly are important foundation skills. Juggling balls and bean bags came next. You have to practice throwing with your left and right hands so that the balls always go to the same height – in front of you and just above your eye level. It is much harder that it looks. Some skilled children did succeed with three balls – well done! Tom could juggle items around his legs and throw and catch it with ease. It looks so easy but you just try it. How do you stage a pretend fight between clowns and or make the audience think you have stamped on the other clowns foot? (In fact it is all an illusion because you miss the other but the audience cannot see exactly what happened). This seemed to be the favourite activity at the event. The children worked in pairs to develop a short show involving tripping, punching and stamping on each other (not really). After several practices there was a chance for five teams to present their skills to everyone else. This was very funny with several teams showing their well developed dramatic skills and some having an amusing script as well with voice accents thrown in. Well done to our school budding circus performers. All too soon it was over and time to get back to normal lessons. But next time we go to the circus the girls will be on the lookout for clown fights and skilled juggling. We now know how to juggle but doing it is much harder – it takes lots and lots of practice. Look out for Tom at future PTA events!